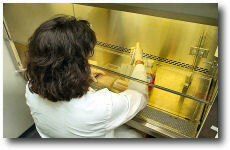 Research in the Fish Immunity Laboratory is dedicated to the study of the immune defense mechanisms of finfish. Laboratory staff and students are currently using cellular and molecular methodologies employed in biomedical research to gain an understanding in the mechanisms important to fish health. Knowledge gained through these studies has, in the past, resulted in the development of vaccines and diagnostics for use in aquaculture.